Review: Rite of Spring and Firebird by the Mariinsky Ballet/Orchestra – where are we now? There is a recurring theme in the arts that if you try and reconstruct something ancient using modern resources, you end up with something new entirely. By trying to recreate the experience of ancient Greek theater, both opera and the music of Harry Partch emerged. Neither got the original experience perfectly right, but instead created something new with their resources. The same thing happened when Stravinsky and Nijinsky tried to recreate the experience of the inhabitants of ancient Russia. They certainly didn’t recreate it exactly, but what we got out of it was The Rite of Spring, one of the greatest ballets ever. The Mariinsky Orchestra and Ballet’s performances of The Firebird and The Rite of Spring on DVD is a great performance that highlights a similar process that went into these works’ reconstruction. With no video documentation of the original productions, the choreography was painstakingly reconstructed from sketches, diaries, and reviews of the original productions. The process of reviving these works parallel their artistic inception. As someone who has more familiarity with Stravinsky’s music, the choreography especially stood out. 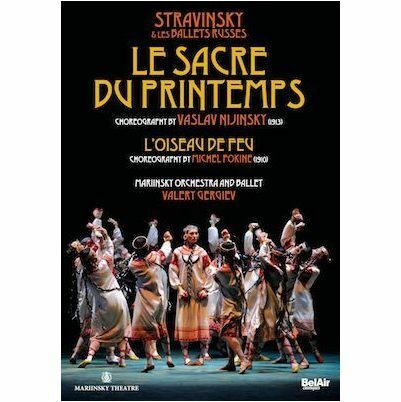 While Stravinsky’s music on its own can be a freewheeling beast in the concert hall, the performances and the interviews on this DVD reiterate that the choreography was what really elicited the violent, riotous reaction from the audience. The music projected very well on TV speakers—I could hear the winds very clearly and that was really great for me. If you’re familiar with the Firebird suite, you might get thrown off by the pacing of the themes in the unabridged work, but overall it’s still quite enjoyable even if you’re just listening and not watching. From the choreography side, if you’re looking for a DVD for your 4-year-old daughter who likes ballerinas to watch, this is not the thing to get. While there are some traditional Swan-Lakey kinds of gesturing, especially in Firebird, a lot of the dancing is angular, gyrating, almost-epileptic movement. Don’t get me wrong, it’s AWESOME, but it’s not traditional. I was in awe at the physicality of these dancers, especially of the crotchety yet powerful King Katschei in Firebird. There are some flubs that make it into the final cuts of these performances, like an apple being dropped on the stage that gets in the dancers’ way during Firebird, but chalking them up to the variability and excitement of live performance, you can easily get past it. The supplemental material, including interviews with the artistic team that mounted the production, is informative and not overly long. This material focuses on the choreography, and not so much on Stravinsky’s compositional process, but it’s still a great resource for musicians, dancers, and amateurs alike. and building a close bond between the horse and rider is an important aspect of riding.